The University of New Hampshire has earned the first Environmental Protection Agency ENERGY STAR rating for residence halls in the nation. Congreve, Lord, and McLaughlin halls are the first dorms in the country to earn the energy efficiency rating, familiar to buyers of appliances and computers. EPA Region 1 Administrator Robert Varney recognized UNH in a ceremony on campus May 8. The students entered data on each building’s energy use into EPA’s Portfolio Manager software, which scores building on a scale of 1-100. A score of 50 is an average building compared to similar buildings based on size, function, and location. A score of 75 or better is required to earn an ENERGY STAR label. Congreve scored 87, while Lord and McLaughlin both scored 84. To ensure that each building met proper comfort requirements, the students also took measurements to verify adequate lighting, ventilation and temperature in each building. Recent extensive upgrades in these residence halls, part of a campus-wide Climate Education Initiative to conserve energy and lower greenhouse gas emissions, are saving UNH nearly $80,000 per year compared to an average dorm in the United States. Compared to average performing residence halls of similar size, Congreve, Lord and McLaughlin Halls are preventing pollution equivalent to taking more than 100 vehicles off the road for a year—more than 65,000 gallons of gasoline. Over several decades, UNH has incorporated many energy efficiency measures into the design and operation of campus buildings. Through a series of retrofits and educational programs, it is estimated that the university saves $4 million annually in energy compared to national average. Sophisticated facility management efforts include energy-smart lighting, revamped building control systems and energy education for maintenance and operations staff as well as the broader university community. ENERGY STAR is a government-backed program helping businesses and consumers protect the environment through superior energy efficiency. Americans, with the help of ENERGY STAR, prevented 35 million metric tons of greenhouse gas emissions in 2005 alone equivalent to the annual emissions from 23 million vehicles – and saved about $12 billion on their utility bills. UNH is a climate protection campus whose students, faculty, and staff work together to conserve energy, lower greenhouse gas emissions, and improve the quality of life and the environment on campus. A national leader in sustainability and energy efficiency, the University was recognized in 2000 as being in the top five percent of research universities for energy efficiency. Along with the establishment in 2005 of a campus-wide Energy Task Force, UNH has earned several regional and national awards for its innovative energy conservation efforts, which range from propane- and biodiesel-powered vehicles to its recycling and composting programs. 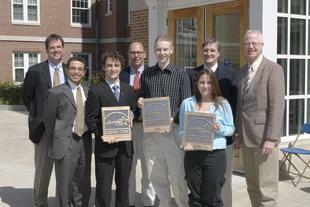 Caption: UNH students Demetri Kouloheras, Ashleigh R. Kreider and Jennifer Rheaume hold the ENERGY STAR plaques presented to UNH by EPA.